Pakistan has a population of 193 million with almost 366,000 cases of TB reported in 2016 and only 69% coverage for TB treatment. The private sector provides 70% of Pakistan’s health care, and retail pharmacies are often the first point of care because they offer convenient hours, geographic accessibility, and privacy. However, they had not been enlisted as a formal sector in TB case detection. According to the countdown to 2030 report, the country has a neonatal mortality rate at 46/1,000 live births in 2015 and only 52% of births are attended by skilled birth attendants and about 12% of under-5 deaths are due to sepsis. SIAPS, with support from USAID, has provided technical assistance to the MOH in introducing 7.1% chlorhexidine for umbilical cord care in Pakistan and also worked with the National TB Control Program (NTP) on engaging private sector pharmacies in early TB case detection. SIAPS and the NTP conducted a survey in private pharmacies to assess knowledge, attitudes, and practices related to TB; findings suggested the strong potential to contribute to TB care. 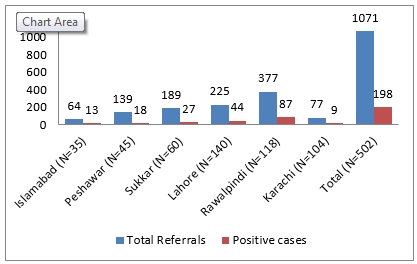 Under the public-private mix initiative to increase early TB case detection, six high-burden districts were selected. SIAPS supported the development of the curriculum to train pharmacy staff; 502 pharmacies were engaged, of which more than 50% served largely rural and peri-urban vulnerable populations. Under the UN Commission, SIAPS supported the introduction of 7.1% chlorhexidine for umbilical cord care in Pakistan. Stakeholder’s meetings were conducted to advocate for inclusion in the essential medicine list (EML) and standard treatment guideline (STG). SIAPS supported the development of a country introduction plan in consultation with local stakeholders. Initial discussions were held with potential manufacturers to start local production. NTP staff were trained on QuanTB and they participated in regional workshops at the Global TB Supply Chain Meeting in Bangkok. Over 7 months, pharmacy staff who had been trained on screening clients with TB-like symptoms referred 1,071 clients to diagnostic and treatment centers, where 77% were traceable and 18% tested positive. A national chlorhexidine introduction strategy was produced. 1% Chlorhexidine has been added to the national and provincial EMLs and STG for umbilical cord care. QuanTB has been implemented and used nationally. As a result of the initiative on engaging pharmacies, the NTP has taken it up and made a policy decision to include private pharmacies in the 2020 national strategic plan for TB control. TB medicines are better forecasted using QuanTB.